I had a conversation recently with a gentleman about Islam. He had attended an interfaith event. We talked about Islam, and he shared many of the mean-spirited stereotypes that many hold about Muslims. Unfortunately these stereotypes lead to all manner of irresponsible actions, including the arrest of a teenager who happened to have made a clock. But, he's a Muslim, and Muslims are terrorists. Martin Marty speaks of recent events in the South where Islamophobia is rampant. Unfortunately it's pretty widespread across the country, including here in Michigan, which has a sizable Muslim population. My plea is for a willingness to listen to the other. Don't let the stereotype define your vision! Take a read of Marty's posting -- as is always true there is much wisdom here. A citizen can look in any direction on almost any day and find confirmation of two observations which have informed many of us who chronicle and comment on inter-group conflicts. Newcomers and “others” become objects of hate, throwing, and shooting. A headline in The Economist (Sept. 26) might suggest conflict in some largely Muslim country far away, who knows where: “Some stand with Ahmed.” Ahmed must be—the thought crosses the mind—a terrorist or some other threat to peace. Un-cross that instinctive surmise: he is meek Ahmed Mohamed, a 14-year-old precocious schoolboy inventor, who made the mistake of bringing a homemade clock to school in Irving, Texas. He was handcuffed and led away by fearful and presumably hateful school officials who assumed that the clock must be a weapon of at least mini-mass destruction. To counter the incident and reward the bright kid there was recompense: an invitation to the White House, a fact that inspired more venom from people who for a long time have been targeting its most visible inhabitant. Hate, for them, is mobile, and the act of shooting, they know, is more significant and satisfying if it has targets. Authors of such stories have no difficulty piling on by piling up stories of similar incidents. But The Economist is not alone in issuing some legitimate qualifiers. First, the South is not alone: Islamophobia is a national epidemic. Second, other kinds of ethnocentrism afflict other centers of “ethnics” of all sorts, to one or another of which we all are likely to be somewhow linked. More empathy for the moderately suspicious but more balanced citizens: some Muslims have been recruited and become supporters of ISIS, the Taliban, and other ominous groups and forces which can awaken fear in any sentient citizen. Also necessarily overlooked in the nature of the case, or necessarily slighted in stories of conflict, not consensus, is the fact that most Muslims in America are not potential terrorists and are as cautious as anyone else about ISIS-type threats or fanatics who are lone rangers on the American civil landscape. Every year, more and more American non-Muslims awaken to the fact that their physician or nurse or community leader or merchant down the block is a practicing Muslim and a generous citizen who welcomes “the other” instead of counter-targeting them. Islam as a faith-community includes stories as frightening as the fierce stories of the God of Israel and thus of Christians, God who is received by followers as a loving motivator for good among those who can find meaning without setting up targets. “Some stand with Ahmed.” The Economist, September 26, 2015, Muslims in the South.http://www.economist.com/news/united-states/21665598-muslims-make-good-southerners-when-people-let-them-some-stand-ahmed. Moghul, Haroon. “Stand with Ahmed against Islamophobia.” CNN, September 16, 2015, Political Op-Eds. http://www.cnn.com/2015/09/16/opinions/moghul-islamophobia-america/. Taranto, James. “Stand with Ahmed: But against the ‘Islamophobia’ myth-makers.”Wall Street Journal, September 18, 2015, Opinion/Best of the Web.http://www.wsj.com/articles/stand-with-ahmed-1442597070. Patil, DJ. “We Stand with Ahmed (and We Hope He’ll Join Us for Astronomy Night).The White House Blog, September 16, 2015.https://www.whitehouse.gov/blog/2015/09/16/we-stand-ahmed-and-we-hope-hell-join-us-astronomy-night. “South Carolina: As jihad threat in America skyrockets, FBI urges Muslims to report…Americans.” Stop Amnesty for Illegal Aliens Blog. July 31, 2015.https://creepingsharia.wordpress.com/2015/07/31/south-carolina-fbi-pander-in-holy-islamville/. “American Muslims in the United States.” Teaching Tolerance: A Project of the Southern Poverty Law Center. Accessed October 2, 2015.http://www.tolerance.org/publication/american-muslims-united-states. Else Frenkel-Brunswick and John Dewey are quoted by Lewis Coser in The Functions of Social Conflict. New York: The Free Press, 1956. 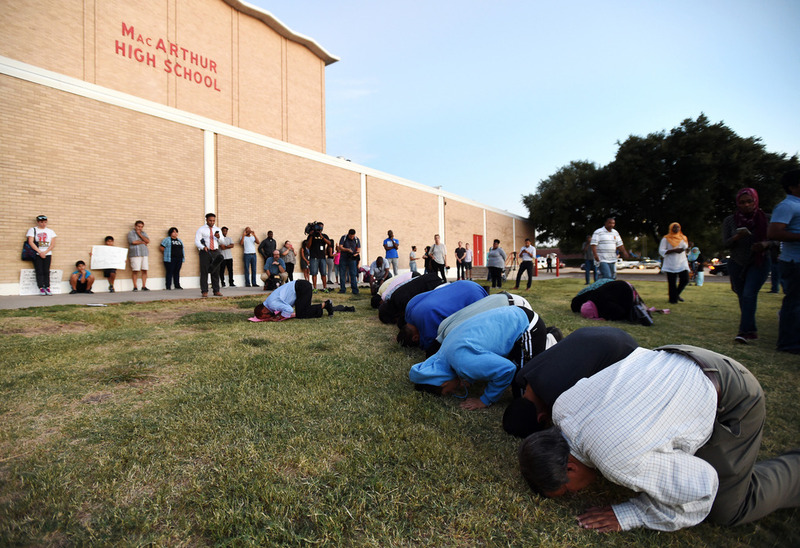 Image: Muslims in Irving, Texas, hold a prayer vigil in front of MacArthur High School where Ahmed Mohamed, 14, was arrested, Sept. 14, 2015, when teachers and police believed that the clock he built and brought to school was a bomb (Sept. 17, 2015); Credit: Jeffrey McWhorter / AP Photo.